Cheesecake: Combine cracker crumbs, sugar and butter; press onto bottoms of 4 (9-inch) springform pans. Pour batter over each crust over each crust. Bake according to recipe; cool completely. Refrigerate several hours or until chilled. Cut each cheesecake into 12 slices. Spiced Pear-Nut Compote: Cook pears, sugar, lemon zest and orange zest in saucepan on medium heat 15 to 20 min. or until pears are softened. Add spices; cook 2 min. Cool slightly. Stir in nuts and candied orange pieces. Cool to room temperature. 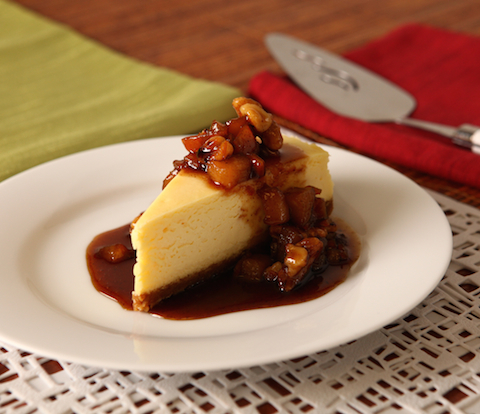 For each serving: Top 1 Cheesecake slice with 1.5 oz. Spiced Pear-Nut Sauce.